TH E M R EP O RT | 57 O R I G I NAT I O N S E R V I C I N G DATA G O V E R N M E N T S E C O N DA R Y M A R K E T GOVERNMENT THE LATEST Older Americans Lodge Reverse Mortgage Complaints with CFPB Reverse mortgages, financial scams, and zero-interest credit cards come in as the group's biggest financial concerns. C onsumers aged 62 and older face a unique set of financial difficulties, according to the Monthly Com- plaint Report released by the Con- sumer Financial Protection Bureau (CFPB) in May. One of their prime concerns? Servicing issues with reverse mortgages. According to the report, "servicing problems with reverse mortgages" came in as one of the most complained-about issues from consumers at least 62. Often, these problems even lead to erroneous foreclosure. "Older consumers with reverse mortgages seeking to stay in their house following the death of the borrowing spouse report servicing problems that sometimes result in foreclosure proceedings," the CFPB reported. Complaints surrounding reverse mort - gages have long been common. The CFPB even produced a report on the matter in 2015. The report showed that 1,200 reverse mortgage complaints were filed between December 2011 and December 2014. The most-cited concerns were "difficulty with changing the loan terms" and "problems communicating with loan servicers." Overall, complaints related to mortgages in general comprised 26 percent of all CFPB complaints submitted by consum - ers 62-plus; that's 10 percent higher than the number of mortgage-related complaints from consumers under 62. In addition to mortgage complaints, older consumers also often report difficulties recov - ering funds after being financially scammed, fees charged for unauthorized add-on prod- ucts and services, and confusion surrounding deferred-interest and zero-interest credit cards. "With more than 10,000 Americans turn- ing 62 every day, older consumers are one of the fastest-growing consumer groups in the marketplace," the CFPB reported. "While older consumers are living longer and healthier lives than ever before, a growing number of older consumers face financial exploitation, struggles with debt, and enter - ing retirement with limited savings." According to CFPB Director Richard Cordray, aging consumers are at a higher risk for financial issues than their younger counterparts. "Older consumers who may be on a fixed income are at a greater risk for financial trouble if they encounter prob - lems with financial products or services," Cordray said. "The complaints submitted by older consumers are important for the bureau to ensure we are properly looking out for this segment of the population." CFPB complaints from older consumers were most common in California, Florida, and Texas. The three states accounted for al - most 25 percent of all complaints since 2011. Tax Reform Could Put Homeownership Out of Reach The NAHB comes out in support of the mortgage interest deduction—which President Trump's proposed tax reform would alter drastically for most Americans. M ore than 70 percent of Americans believe owning a home is an essential part of the American Dream, but with potential tax reforms on the way that could make homeowner - ship less affordable for many, the National Association of Home Builders (NAHB) says there's still much work to be done. If President Trump's plan for tax reform moves forward, a large percentage of American homeowners would be un - able to deduct mortgage interest from their annual federal income taxes. Though the plan does not outright eliminate the deduction, it does raise the threshold of who can use it—and once on the books, it will mean only home - owners with hefty home loans will qualify. This, according to the NAHB, could create an affordabil- ity problem. "A key component in the ability of families of all income levels to become homeowners is the mortgage interest deduction, which has been a cornerstone of American housing policy since the inception of the tax code more than 100 years ago," the NAHB reported. According to data from the Congressional Joint Committee on Taxation, the deduction has primarily benefited middle-class taxpayers thus far. 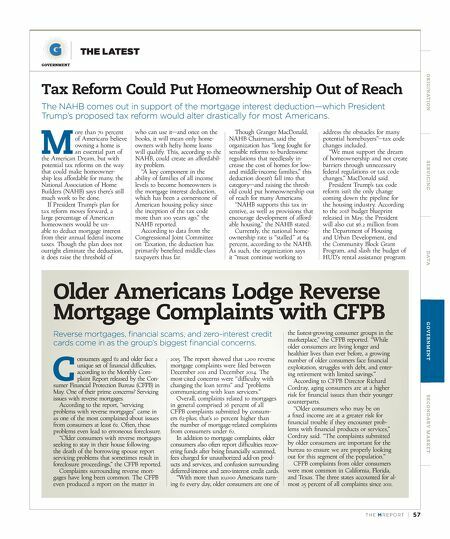 Though Granger MacDonald, NAHB Chairman, said the organization has "long fought for sensible reforms to burdensome regulations that needlessly in - crease the cost of homes for low- and middle-income families," this deduction doesn't fall into that category—and raising the thresh - old could put homeownership out of reach for many Americans. "NAHB supports this tax in- centive, as well as provisions that encourage development of afford- able housing," the NAHB stated. Currently, the national home- ownership rate is "stalled" at 64 percent, according to the NAHB. 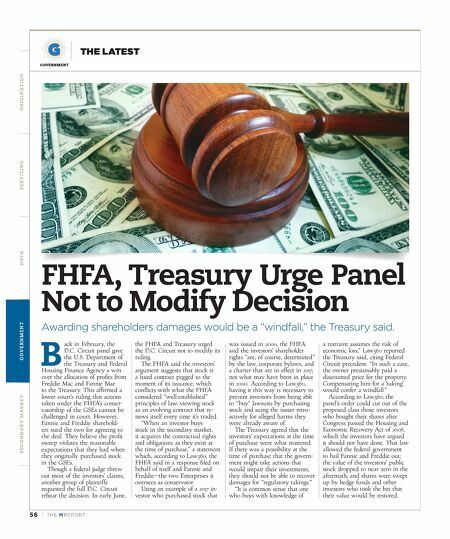 As such, the organization says it "must continue working to address the obstacles for many potential homebuyers"—tax code changes included. "We must support the dream of homeownership and not create barriers through unnecessary federal regulations or tax code changes," MacDonald said. President Trump's tax code reform isn't the only change coming down the pipeline for the housing industry. According to the 2018 budget blueprint released in May, the President will also cut $6.2 million from the Department of Housing and Urban Development, end the Community Block Grant Program, and slash the budget of HUD's rental assistance program.